After an extensive national search with an impressive slate of candidates, Philanthropy Northwest is pleased to announce that Kiran Ahuja will be our next CEO. Ahuja brings more than two decades of public service and nonprofit sector leadership experience, including senior positions in the Obama administration, to our six-state network of foundations and corporate giving programs. In her new role, she will lead one of the oldest regional associations of philanthropists in the country, joining us at a critical time for the sector and our communities. Ahuja has made it her life’s work to serve diverse communities, including African American, Asian American and Native Hawaiian. She began her career as a civil rights lawyer at the U.S. Department of Justice, litigating long-standing desegregation cases, and filing the department’s first student racial harassment case. From 2003 to 2008, she served as the founding executive director of the National Asian Pacific American Women’s Forum, an advocacy and membership organization with regional chapters around the country, including NAPAWF Seattle. She spent six years as executive director of the White House Initiative on Asian Americans and Pacific Islanders, leading efforts to increase access to federal services, resources and programs for underserved Asian Americans and Pacific Islanders (AAPIs). In that role, Ahuja assembled a historic gathering of philanthropists at the White House in 2012 to discuss the state of AAPIs and leverage resources and public/private partnerships between foundations and government to support AAPI communities. She went on to serve as chief of staff at the U.S. Office of Personnel Management, where she played a key role in building the dynamic senior leadership team at a critical juncture for the agency, managing a $2 billion budget and 6,000 employees, and broadly supporting more than two million employees across the federal government. “I'm excited to be joining Philanthropy Northwest, a strong and vibrant learning network committed to serving its members and supporting important causes in the region, including my deep commitment to diversity, equity and inclusion,” Ahuja said. “Philanthropy Northwest is also at an exciting period in its own trajectory, committed to innovation and expanding the role of philanthropy. I look forward to meeting our members and gaining a better understanding and appreciation of their ideas, perspectives and plans for the future." Ahuja grew up in Savannah, Georgia, where her family immigrated to the United States from India and England. Her parents ran a medical clinic in Savannah’s inner city, first exposing her to entrenched challenges faced by impoverished communities. She earned a bachelor’s degree in political science from Spelman College and a law degree from the University of Georgia. The process to find Philanthropy Northwest’s fifth leader was led by a committee of our board members, chaired by Raikes Foundation Executive Director Erin Kahn, in partnership with The 360 Group, a national executive search firm dedicated to creating social impact by placing exceptional leaders into extraordinary mission-driven organizations. Please join us in welcoming Kiran Ahuja to her new role on June 19. 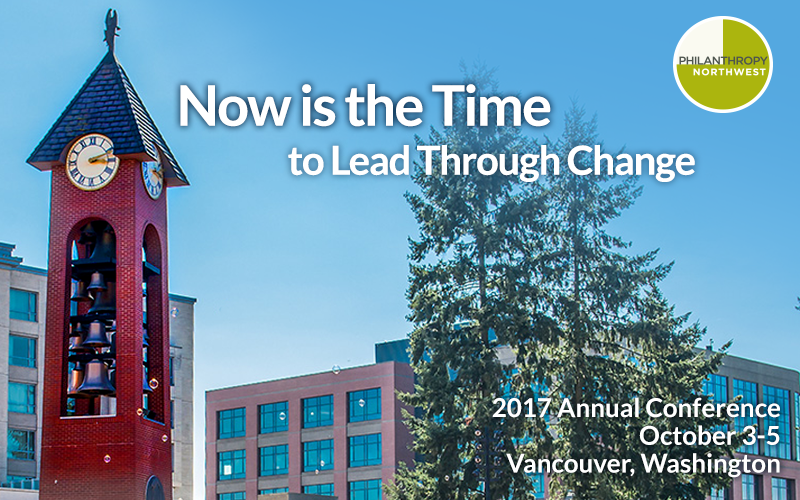 She looks forward to traveling throughout our region in the summer and fall — culminating in a special reception at our 2017 Annual Conference, Now is the Time to Lead Through Change, October 3-5, in Vancouver, Washington. Founded in 1976, Philanthropy Northwest is a learning network of philanthropists committed to communities in Alaska, Idaho, Montana, Oregon, Washington and Wyoming. Through shared experiences and action across sectors, we become more skillful in our work and advance a vision that Northwest communities have vibrant, healthy futures that honor our past, our people and our cultures. For more information, please visit www.philanthropynw.org.